This moon poem is so seeming small but with such an open heart that to say too much might disturb it. All that should be noted then is that it was written by T.E.Hulme, friend of Ezra Pound and avatar of the imagist movement. The play it describes must have been I think all the same rather consequent and solemn. Mina Loy is a poet not quite like anyone else. She seems to have had at least four careers and nine lives. Still, her weirdly worded strange (and estranged) geographies penetrate places other poems don’t reach, and in this anticipate Elizabeth Bishop without sounding at all like her. Hardly surprising: she writes as if in a foreign language; from the far side of the moon. Where better then to look for poems about the moon than in The Lost Lunar Baedeker (Carcanet, 1996, ed. Roger Conover), which contains the best (and most openly, consistently edited) selection of her poems. The edition is like some of her poems, with the working on the outside. I can’t make up my mind if the following moon poem is profound or mischievous. But then, it is perhaps as contradictory a poem as its contradictory parts, holding incompatibles in humorous tensions: ‘unendurable ease’, ‘thermal icicles’, and ‘inverse dawn’ (a dusk?). Nor do I know what might lie beneath those three em dashes. Maybe they are naughty. Maybe not. This too makes them rather like the poem. our every corpuscle become an elf. Giacomo Leopardi was born three years after Keats in 1798, and died in the same year as Pushkin, in 1837. The feeling of his time made him a thoroughgoing Romantic, but he had a Classicist’s attention to the ancient past. The moon contained for him therefore manifold and venerable associations lurking in shadows; so landscapes flooded by moonlight feature in many of his poems. None does so however so simply and touchingly as in the following lyric ‘Alla Luna’. This seems to have begun life as a sonnet, but on reflection the last two lines were added. I couldn’t find a translation, quite, that I liked; I wanted to keep the last two lines intact. So I attempted one of my own, which appears below. Just as now, filling all with light. Though things were sad, and troubles last. Yeats is really the master of moon poetry. There are so many moon poems to choose from it seems just to pick one. Much of his philosophical systematizing was based on the moon’s cycle, which produced poems as different as the violent ‘Blood and the Moon’, and the quiet, insinuating ‘The Cat and the Moon’, which compares the crescent moon to a cat’s pupils. He had begun mooning much earlier, of course, and in successive versions of ‘The Sorrow of Love’ its moon changes from ‘curd-pale’ to ‘crumbling’ to ‘climbing’, as it is emptied of poeticisms the better to stand starkly symbolic. Perhaps these revisions inspired a bitter love poem that insisted itself on me and made me reread it again and again recently – with some of its language stripped astonishingly bare (it was written the same year as ‘Sailing to Byzantium’, in 1926) it reads almost like a brutal folk tale, and the coldness and frenzy and longing of it seems properly lunatic. We interrupt these whimsical literary musings with a non-party political broadcast..
a) in 2009 gave himself an illegal tax-evading interest-free loan of €82, 829 from his public speaking company to his personal account. His accountants noticed and informed him he was breaking the law. He now claims this was an accidental clerical error. This is either corrupt or a matter of the most enormous incompetence (the loan was worth 70% of the company). b) claimed that he with his cable expertise company, subcontractors of big property developers, to have created 100 jobs. He admitted yesterday that in the downturn he had to get rid of 80 people. That’s 20 jobs then Sean. Hardly Microsoft. And having been sacked twice yourself you’ll know tough it is. Let’s bring this entrepreneurial spirit to the Aras. c) boasted in January 2009 of ‘a long record of involvement and commitment to Fianna Fail over the past 30 years’. Nothing wrong with this, except then to serve on the National Executive of Fianna Fail for two years, resigning in January 2011, and then to run as an ‘independent’ presidential candidate 5 months later following the March election meltdown is hardly credible. The same January 2009 letter remembers ‘I first served on the National Executive with Charlie Haughey in 1985-1987’, and notes his work as Political Secretary to Rory O’Hanlon as Fianna Fail Minister for Health and Minister for the Environment, and as a ‘full time’ fundraiser for the party ‘in Fianna Fail headquarters’. These are not the actions of a ‘grass-roots’ member, which he claims to be. d) lied yesterday on live television. He claimed he did not organise and personally collect donations for a 2008 Fianna Fail fundraiser. He did. Under closer questioning he then panicked, and eventually backtracked. He was forced to admit driving to a house to drop off photographs of the event. He still denied accepting there a €5000 donation. Under further pressure he admitted he might have taken a brown envelope. Ye Gods. It seems the businessman involved was also a convicted criminal. It doesn’t matter who people vote for but surely, surely no voting preferences should go to this man. From his own testimony he is a liar, a crook, and an ‘independent’ candidate who is fact an influential executive and fundraiser for a corrupt political party whose decisions condemned Ireland to economic armageddon. Remember Zammo, Ireland. Just say no. Don’t listen don’t listen to anyone else. All you gotta do is be yourself. 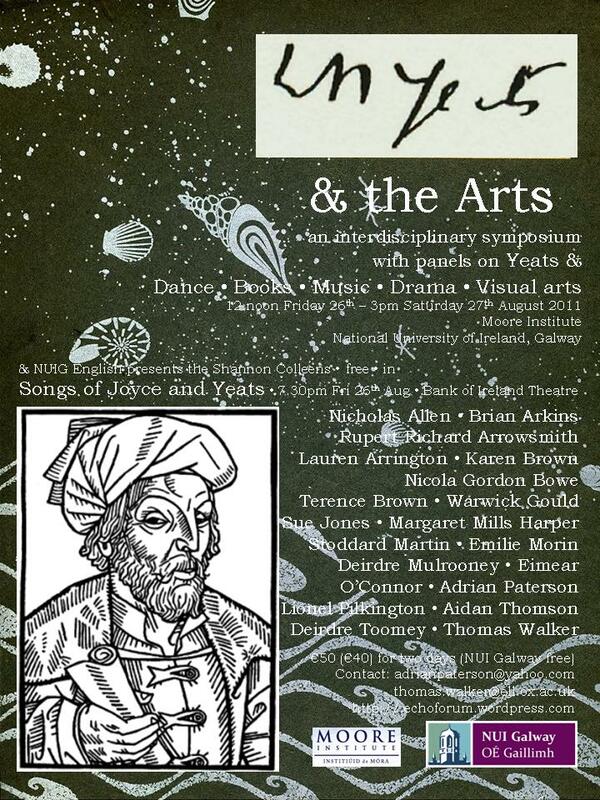 W.B.Yeats and the Arts begins on Friday 26th August at 12 noon.